Worshipers at the Interregional African American Catholic Evangelization Conference attend a worship service in African garb. 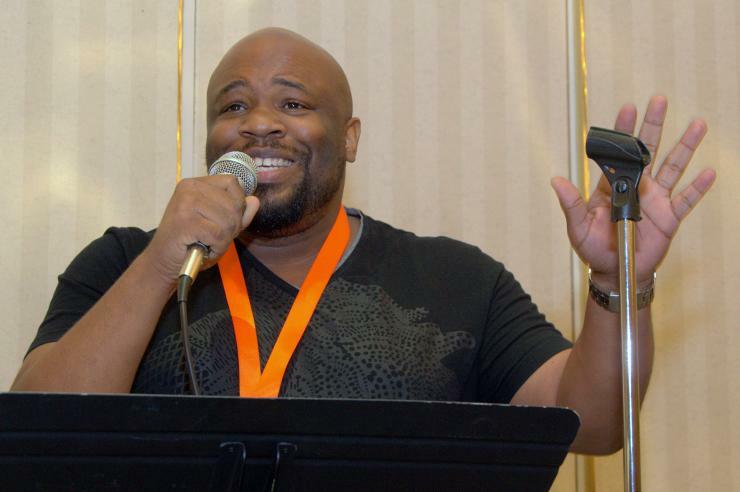 Robert Brown of Holy Redeemer Church, Miami, sings during the Interregional African American Catholic Evangelization Conference in Miami. 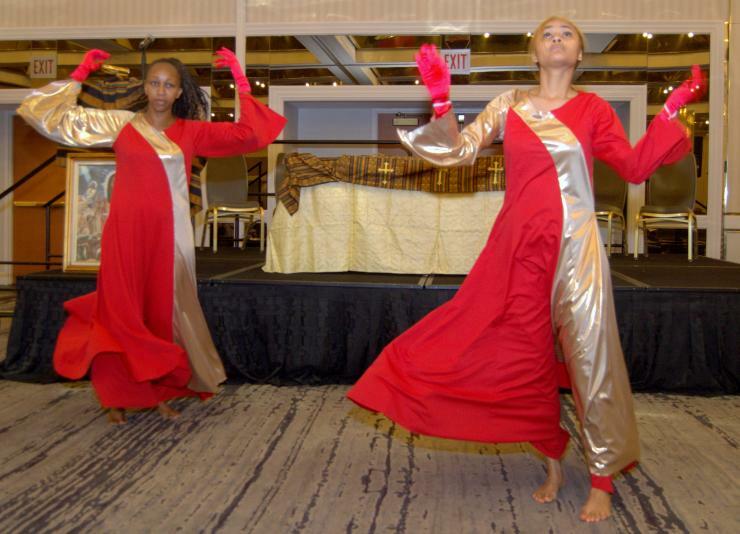 Brittany Coldwell, left, and Tianna Banks perform liturgical movement during a praise service at the Interregional African American Catholic Evangelization Conference. Both are from the Diocese of Cleveland. 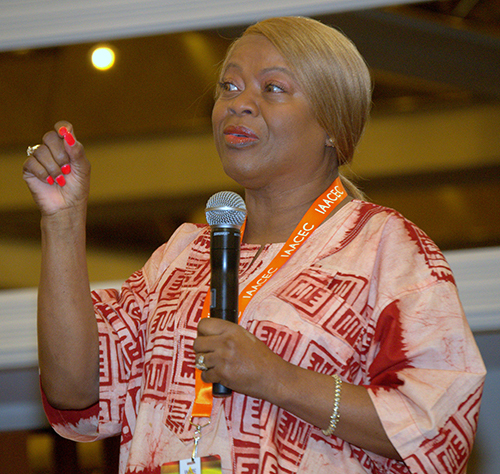 M. Annette Mandley-Turner, founder of the Interregional African American Catholic Evangelization Conference, speaks during its recent conference in Miami. Father Maurice Emelu, a priest of the Diocese of Orlu in Nigeria, speaks during the Interregional African American Catholic Evangelization Conference in Miami. Attendees from the Archdiocese of Miami pose for a photo at the Interregional African American Catholic Evangelization Conference. From left are Dorothy Paul, Tamara Hospedales, Wilhelmina King, Donna Blyden and Virginia Cox. 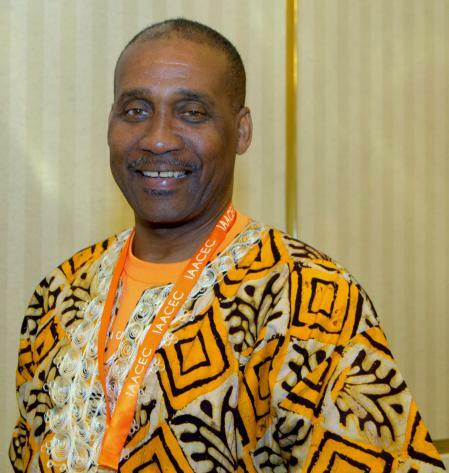 Dave McFarlane of St. Helen Parish in Fort Lauderdale said he wanted to learn from instructors at the recent Interregional African American Catholic Evangelization Conference in Miami. 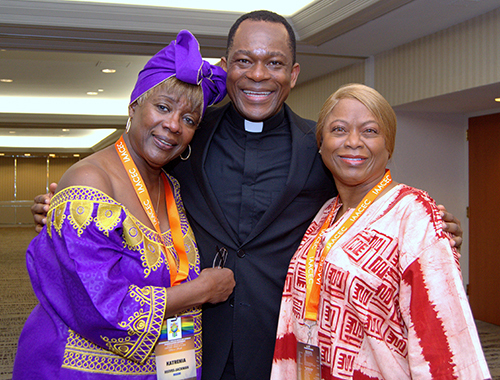 Katrenia Reeves-Jackman, left, poses with Father Maurice Emelu and M. Annette Mandley-Turner, founder of the Interregional African American Catholic Evangelization Conference. Reeves-Jackman directs the Office of Black Catholic Ministry for the Archdiocese of Miami. African-themed books and cards are offered for sale during the Interregional African American Catholic Evangelization Conference in Miami. Michael Taylor of St. Philip Neri Church in Miami Gardens says he's seeing more attention to contributions of black Catholics. Emmanuella and Lester Kelly of Visitation Parish in Miami said the Catholic Church needs a continuing black presence. MIAMI | M. Annette Mandley-Turner birthed a series of black Catholic conferences a quarter-century ago. But in a real way, the grandfather was Pope John Paul II. That’s how she recalled the genesis of the Interregional African American Catholic Evangelization Conference, which met in Miami Aug. 10-12. That calling has grown into the biennial evangelization conference. Visiting South Florida for the first time, it showed off the blend of African culture, vigorous worship and traditional Church spirituality that marks black Catholicism. The 240 attendees represented 11 dioceses from around the country. Large groups came from Cleveland and Louisville. Groups came from several parishes around the Archdiocese of Miami as well. M. Annette Mandley-Turner, founder of the Interregional African American Catholic Evangelization Conference, speaks during its recent conference in Miami. More than 200 attendees, representing 11 dioceses from around the country, took part in the conference, which met in Miami for the first time, Aug. 10-12. Just the togetherness — “being with hundreds of black Catholics in one room for one purpose” — was enough for LaQuisha Andrew, of the Diocese of Cleveland, attending her third biennial conference. Like others there, said she enjoyed her distinctiveness as a black Catholic. Cultural markers abounded in and out of the formal meetings. A small marketplace sold Kwanzaa cards, black Catholic prayer service books, and images of the dark-skinned St. Martin de Porres and Our Lady of Regla. 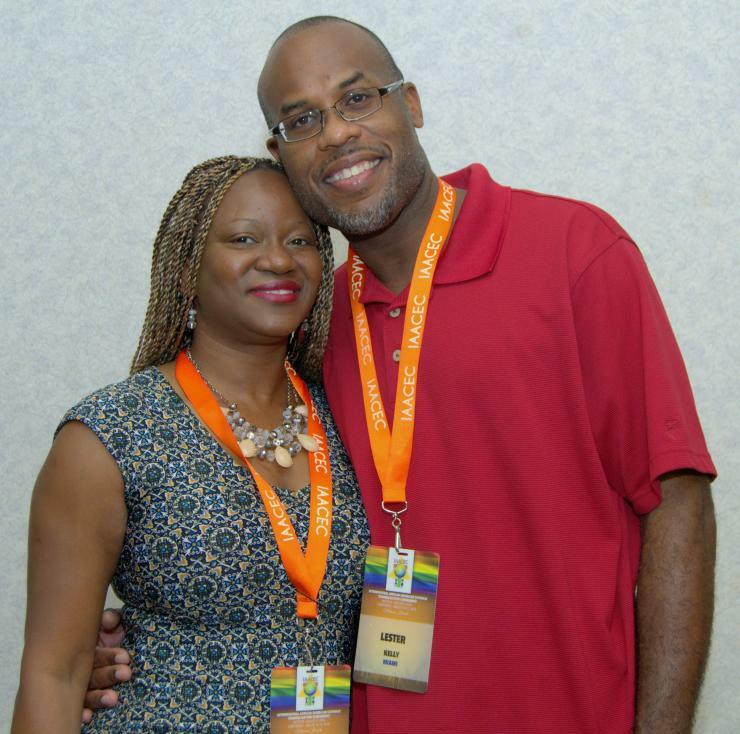 Most of those at the Saturday sessions came in eye-catching kente and batik garb. Preaching, too, was African American style. 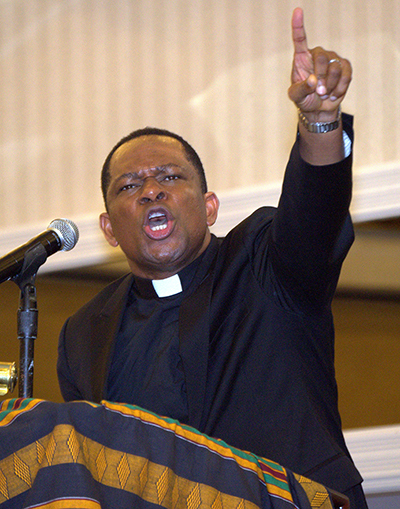 In his keynote speech, Father Maurice Emelu joked, shouted, whispered and made sweeping gestures as he urged his listeners to use their gifts for ministry. “Whether you are appreciated or not, do good anyway,” the Nigerian priest said, to calls of “God bless” and “Come on now” from the congregation. “To do good is the best way to combat evil. Sown among the praise and worship were 25 breakout workshops. Topics including apologetics, children’s ministry, liturgical movement, the need for worship, and the future of blacks in the Church. Dorice Firmin, 30, said she’s been coming to the conferences since her parents brought her at the age of 10. As an adult, she values the knowledge she can bring back to her church in the Archdiocese of Louisville, where she has served as a singer, youth minister, dance coordinator and chair of formation ministry. This conference, she had a sense of destiny, she said. At first, it looked like lack of money was going to keep her away, but then she found her brother was going to drive to Miami. She saved more by staying with family in town. Katrenia Reeves-Jackman, left, poses with Father Maurice Emelu and M. Annette Mandley-Turner, founder of the Interregional African American Catholic Evangelization Conference. Reeves-Jackman directs the Office of Black Catholic Ministry for the Archdiocese of Miami. 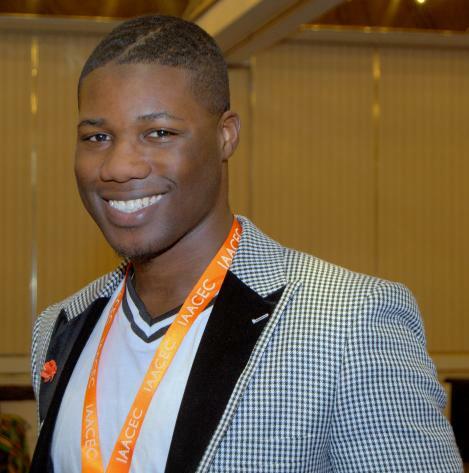 About a quarter of those at the conference were 19 to 35 years old, Mandley-Turner said. Among them was Dave McFarlane, 21, from St. Helen Church in Lauderdale Lakes. Drawing from three strands — African roots, Catholic religion and American citizenship — black Catholics have a unique contribution to make, conference goers and organizers alike said. The Miami conference came by invitation of the archdiocesan Office of Black Catholic Ministry. The biennial conferences grew out of a series of conferences sponsored by Mandley-Turner’s multicultural ministry office in the Archdiocese of Louisville. Called “The Roots of It All,” the Louisville conferences drew people from a range of states — including Florida, California, New York, Colorado and Nebraska. After six years of meetings, the organization went interregional in 1993. “I realized that I don’t own this,” Mandley-Turner said. Since then, the conferences have been held in cities like Atlanta, Indianapolis, Columbus, Cleveland and Memphis. The very presence of blacks in Catholic pews shows the broad appeal of the Church, in the view of Lester and Emmanuella Kelly of Visitation Church, Miami. Father Maurice Emelu, a priest of the Diocese of Orlu in Nigeria, speaks during the Interregional African American Catholic Evangelization Conference in Miami. Elaborate as it was, the conference ran on a lean $85,000, according to Mandley-Turner. She said the guest speakers got only airfare and hotel rooms. And the eight conference organizers totally paid their own way. “It’s our stewardship,” she said. She added that black Catholic ministries often suffer from limited funding at the diocesan level, which limits programs like educational outreaches. That in turn is caused at least partly by reduced visibility. The United States Conference of Catholic Bishops counts three million self-identified blacks among America’s 71.1 million Catholics. But Mandley-Turner said that doesn’t include black Latinos, immigrants from African nations like Ghana, or biracial people born of blacks and other groups. All told, she guessed that the true number should be more seven million to eight million black Catholics in the U.S. Still, some conference goers said they’ve seen changes. Michael Taylor, of St. Philip Neri Parish in Miami Gardens, believed there’s more appreciation for the contributions of black Catholics. “My experience in the Catholic Church was genuflecting and having a white priest,” said Taylor, who sings in the choir and is a Knight of St. Peter Claver. “That’s changed. There are more priests of African descent. And the music is changing. There’s more gospel. Even amid the frenzy of conferences, Mandley-Turner has her eyes on the horizon. She said dioceses in western states have already extended invitations to hold conferences there. But her ultimate dream is for the conference-goers to expand black ministries in their own parishes and dioceses, especially evangelization. Attendees from the Archdiocese of Miami pose for a photo at the Interregional African American Catholic Evangelization Conference. 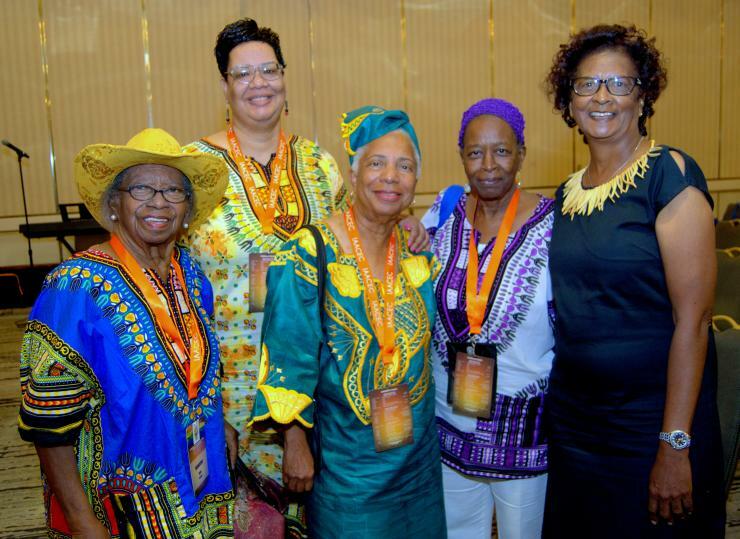 From left are Dorothy Paul, Tamara Hospedales, Wilhelmina King, Donna Blyden and Virginia Cox.